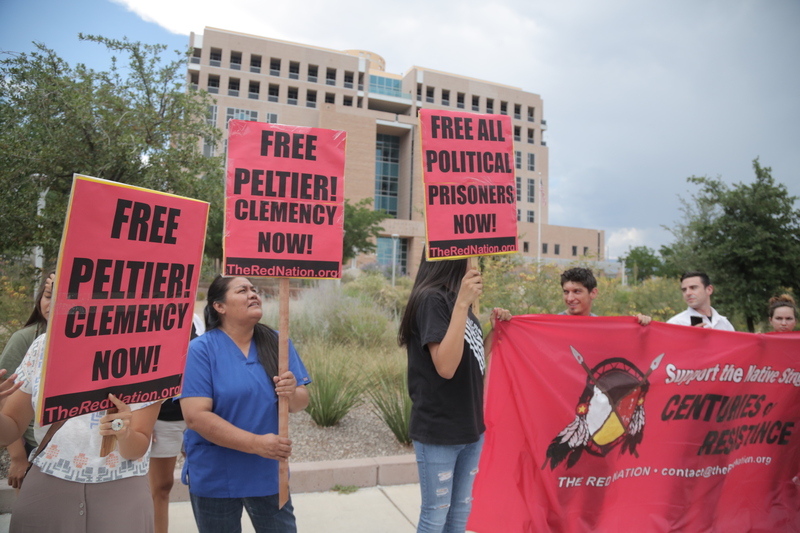 On Friday, June 26, more than thirty people stood outside the Peter V. Dominici federal courthouse in Albuquerque, NM to demand executive clemency for Leonard Peltier, an Anishnabe and Lakota leader of the American Indian Movement (AIM) who was wrongly convicted and imprisoned for the murders of two FBI agents 40 years ago at the Jumping Bull Ranch in the Pine Ridge Indian Reservation. The “stand-out” action was in solidarity with a Freedom Run, Powwow, and Prayer Walk in Oglala, SD in the Pine Ridge Indian Reservation to commemorate “Leonard Peltier Day,” an official holiday of the Oglala Sioux Tribe. Actions demanding Peltier’s clemency were also held worldwide. Peltier supporters held signs that read “Free Peltier! Clemency Now!” and “Free All Political Prisoners Now!” in solidarity with worldwide actions to demand executive clemency for Leonard Peltier. On June 26, 1975, two FBI agents entered the Jumping Bull property in unmarked cars. A firefight ensued, which resulted in the deaths of the two agents and a young Lakota man, Joe Stuntz, whose killing has never been investigated. Although more than 30 witnessed the shooting, none of their testimony was given serious attention in the following investigation. Instead, investigators pinned the killings of the FBI agents on Leonard Peltier and two of his AIM comrades, Dino Butler and Bob Robideau. Butler and Robideau’s charges were subsequently dismissed on the grounds of “self-defense,” while federal prosecutors focused attention on Peltier. At trial, no witness testimony or forensic evidence presented by the prosecution placed Peltier as the perpetrator. Nonetheless, he was convicted of the murders and sentenced to two consecutive life terms for first degree murder. Many discrepancies and inconsistencies existed in the prosecution’s case that have led many to conclude the trial and conviction were political retaliation against AIM and its supporters in the aftermath of the 71-day takeover at Wounded Knee in 1973, an event that catalyzed the Red Power Movement’s demand for Native liberation and self-determination. The violent retaliation, known as the “reign of terror,” was carried out by federal and state officials and vigilantes, which resulted in the imprisonment of AIM leadership and over 30 unsolved murders of AIM members and supporters in the Pine Ridge Reservation. Most of the killings received little or no investigation. The international defense committee for Leonard Peltier is now based out of Albuquerque, NM, operating out of the Indigenous Rights Center, LLC. Peltier’s case has drawn international support from human rights organizations (such as Amnesty International, the Kennedy Center for Human Rights, and the United Nations High Commissioner for Human Rights), government institutions (such as the European Parliament, the Belgium Parliament, the Italian Parliament, and the Cuban government), and notable human rights activists (such as Rigoberta Menchú, Nelson Mandela, Tenzin Gyatso, Archbishop Desmund Tutu, and Rev. Jesse Jackson), among many, many more. The National Congress of American Indians also recently demanded clemency for Peltier. 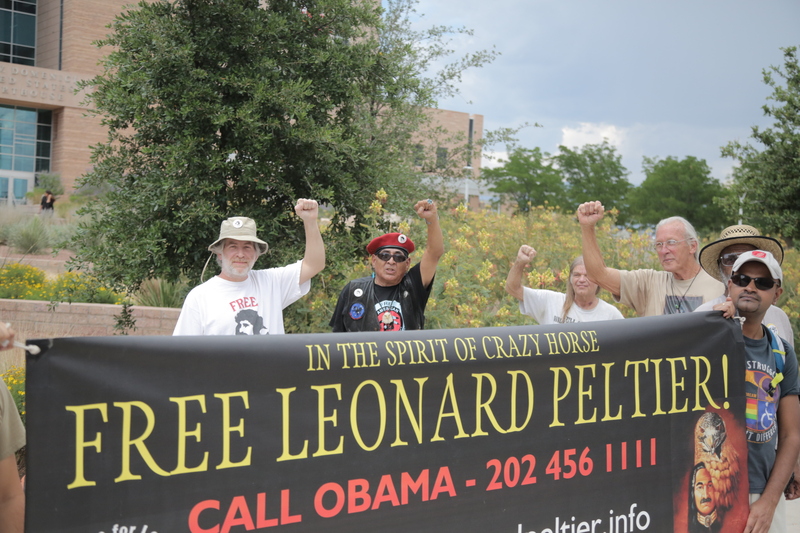 At Friday’s event in Albuquerque, an organizer with The Red Nation and longtime member of the International Leonard Peltier Defense Committee Peter Clark told the crowd that it was the belief of Peltier and his legal defense team that the remaining nineteen months of Obama’s presidency may be “the last chance” for clemency. Addressing the urgency of the situation, Clark and his colleagues co-founded the Indigenous Rights Center, LLC, which now headquarters in Albuquerque and focuses of Peltier’s defense campaign and Indigenous humans rights issues. For more information on how you can support Leonard Peltier go to: whoisleonardpeltier.info. This is the first time that my dear sister Roselyn (Jumping Bull, who’s family lived on property where the shootout took place) will not be there for me, but I know she is there in spirit as she has gone on her journey. I have seen pictures of the gathering over the years and can still see her sitting there under the trees with our relatives… I will always miss her and be grateful to her for all she did for me and for our people. This year I am most concerned with our children and the taking of their own lives. This is very sad to me as it is to you, and I know there are many reasons for them to feel such despair and hopelessness. But I can only ask and encourage all of us to double our efforts to show them love and support, and let them know that we will always look after them and protect them. That includes asking big brothers and sisters to look after the younger ones. They are our future and they have to be protected and to learn to be the protectors. This is not something we can live with, we need to all work to change this. The continued use of racist mascots is not something that we can ever accept as Indigenous peoples and we need to all continue to push to end that racist practice. As for me. Time is something I have learned a lot about in these years in prison. And now I can see that time is slipping away from me and I know that if I do not get out under this President I will almost certainly die here in prison.